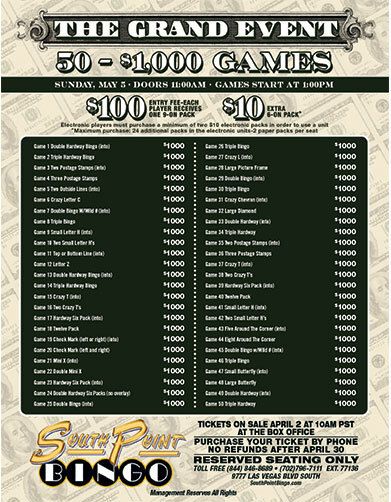 The South Point Bingo Room offers 8 sessions of bingo daily. 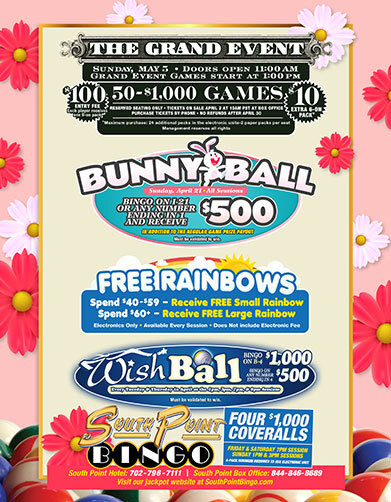 At each session there is a Cashball Jackpot and 12 games of bingo. Plus a progressive Double Action Game and a $10,000 Bonus Coverall in 52 numbers or fewer is offered at every session. Electronic units are also available at all sessions and the fees are $2 per unit. 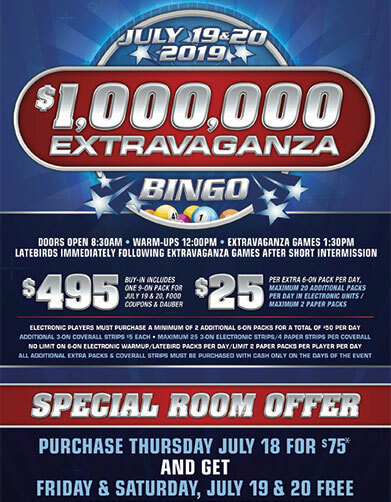 Electronic specials are posted in the Bingo room. To make your bingo experience even more enjoyable complimentary beverages are served to all sessions. Information is unofficial. Current jackpot amounts are posted in the Bingo room. Congratulations to Lori Ann for winning $10,000 on the 48th # on the bonus coverall at the 9PM session on April 9th 2019. Congratulations to Delores for winning $10,000 on the 52nd number on the bonus coverall at the 7PM session on April 4, 2019. Congratulations to our lucky winner Kim for winning our double action for $74785 in 34#. Congratulations David! David won $10,000 on his bonus coverall on Feb. 18, 2019 at our 11AM session. Congratulations to our lucky winner Oscar for winning our 1:00PM session cashball for $13,910. Congratulations to our lucky winner Allison for winning our double action on Feb. 8, 2019 for $74,324 in 34# at the 11AM session. Congratulations to our lucky winner Angel, for winning on the bonus coverall in 52# for $10,000 on Jan. 6, 2019 at the 9pm session. Congratulations to our lucky winner Lyn for winning the double action on the 35# for $120,724. Congratulations Marc for winning $10,000 on the 52nd number on his Bonus Coverall at our 11:00AM session on December 24, 2018. Congratulations to G.J. for winning $10,000 on the 50th number at our 1:00PM. session on Dec.19, 2018 on his Bonus Coverall. Congratulations to Ver for winning $ 10,000 on the 51st# on the bonus coverall at the 7PM session on Nov. 8, 2018. Congratulations to our double action winner M. ont the 35th number winning $118,390 on October 22, 2018 at the 11PM session . Congratulations to Tracy for winning $10,000 on the 52nd # on the bonus coverall at the 7PM session on Sept. 20, 2018. Congratulations to Rhoda for winning $23,338 on the cashball at the 9PM session on Sept. 15, 2018. Congratulations to Sandra for winning $10,000 on the 52nd# on the bonus coverall at the 7PM session on Sept. 14th, 2018. Congratulations to Maria for winning $10,000 on the 51st# on the bonus coverall on Sept. 1, 2018. Congratulations to lucky Jackie for winning $10,000 on her bonus coverall at our 3PM session on August 21, 2018. Congratulations to lucky Janet for winning the double action on the 34#, for $57,959 at the 7PM session on August 17, 2018. Lucky Ruth won the bonus coverall for $10,000 on the 51st#, at the 7PM session on July 29, 2018. Congratulations! Congratulations to Michael for winning the double action on the 33rd# for $40,603 at the 11PM session on June 30, 2018. Congratulations to Shawn for winning the double action on the 35th# for $97,768 at the 7PM session on April 30, 2018. Congratulations to Benita for winning $10,000 on the 51st# on the bonus coverall, at the 7PM session on May 10, 2018. Congratulations to Robert for winning $10,000 on the 49th number, on his bonus coverall, at our 7PM session on April 7, 2018. Congratulations to Angel for winning $10,000 on the 51st number, on her bonus coverall, at our 7PM session on April 3, 2018.